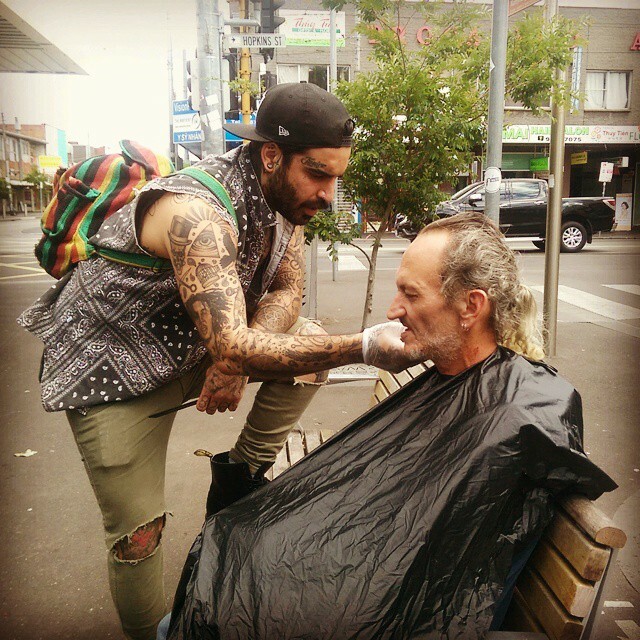 Nasir Sobhani aka ‘The Streets Barber’, is a true Nomad, not just of the world, but also of the mind. Growing up in Japan, attending University in Canada, volunteering his time for Youth Work in the Vanuatu and then Australia to start up his own initiative helping the homeless, Nasir has certainly lived a fruitful life. 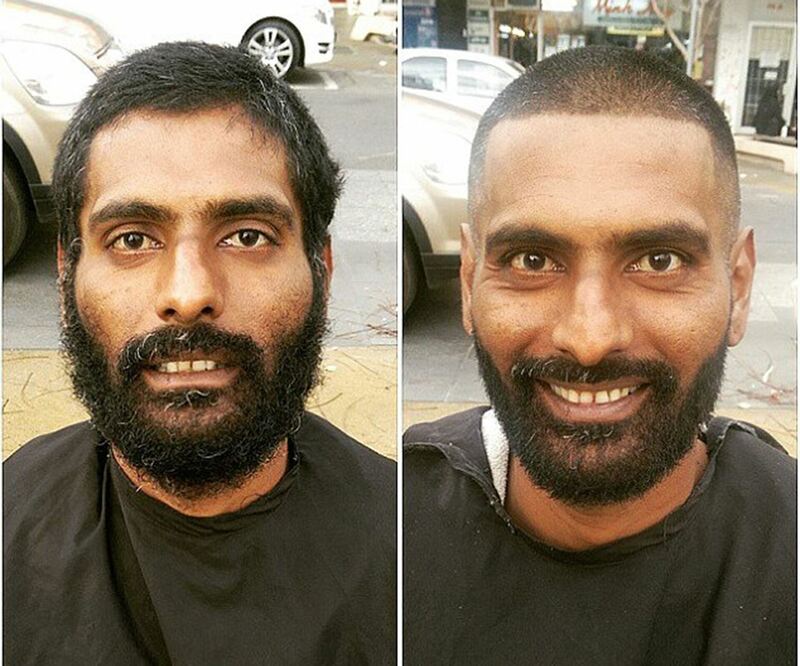 It wasn’t all smooth sailing though, with a crippling drug addiction along the way, Nasir thanks his Baha’i faith and barbering for his new found sobriety. 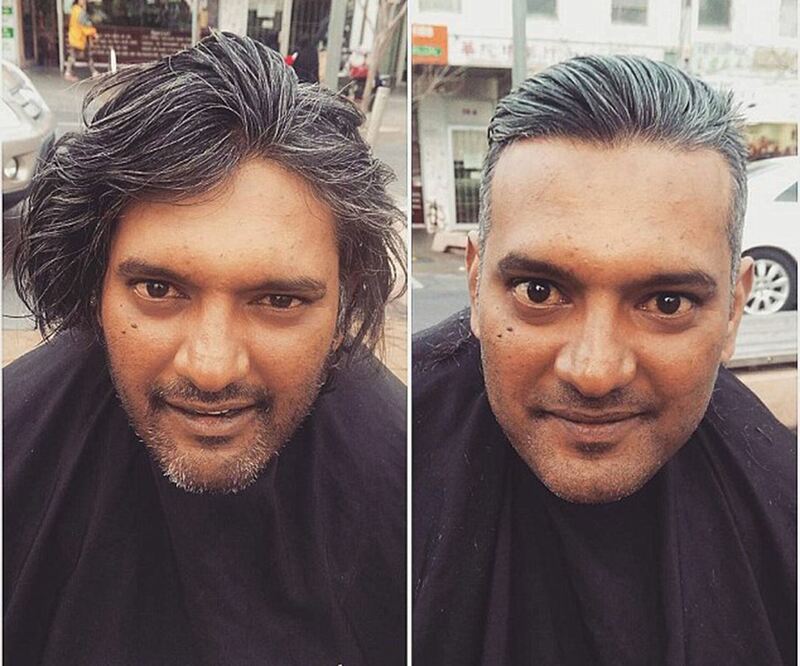 Working six days a week cutting hair, Nasir spends his one day off hitting the streets to give free haircuts to the homeless. He calls it, ‘Clean Cut Clean Start’. Above is Chris. He is 21 years old and has been living on the street since he was 10. This is Ganesh. He started taking heroin after his girlfriend left him, taking their daughter. He is now the fulltime carer of his brother and trying hard to get clean. Above is Andrew, who celebrated his 36th birthday the day before I met him. 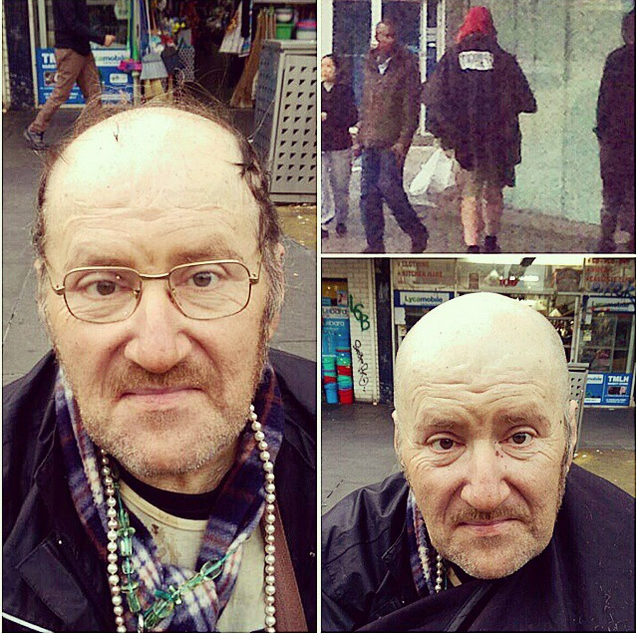 He was sitting on the street with his partner, Carla, and they were both chatting to Charlie – a former street client. As usual, whenever I see a former street client I like to follow up and check in with them, asking them how they are doing. 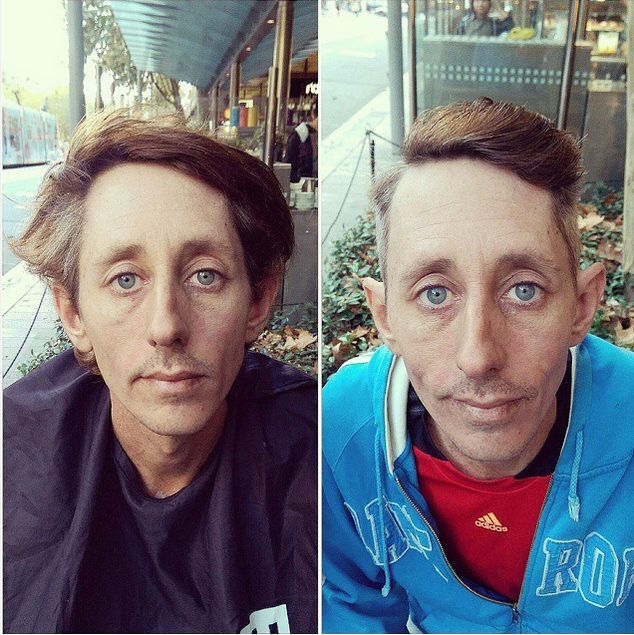 When I went up to Charlie to show her some love, she introduced me to Andrew and Carla and told them how I give free haircuts to the homeless on my day off. You see, Clara had promised Andrew a haircut as a birthday present but neither of them could afford a proper one so he was forced to delay his much desired haircut. I was more than happy to give him one so we got started! I asked what had led him to the streets and he told me that he had been an alcoholic for most of his life. The disease was rampant within his family and he grew up with alcohol always around at home. His mother passed away from alcoholism, which only added to his suffering. He was manipulated into trying heroin by one of his mother’s friends – after being promised that he wont get addicted and it will help mask any pain and grief. Instantly he said he got hooked and as a result of being a slave to the drug it ruined his life and left him homeless for several years. In fact he told me him and Carla had recently shot up and used up any money they had in order to get that day’s fix. This meant no food, no gifts, no haircut. Some birthday, huh? Andrew told me he had enough of this lifestyle and wanted his life back. I shared my story and how I just hit my 3 year sobriety mark last month. He asked how I stopped and I explained to him that rehab played a vital role in my recovery. 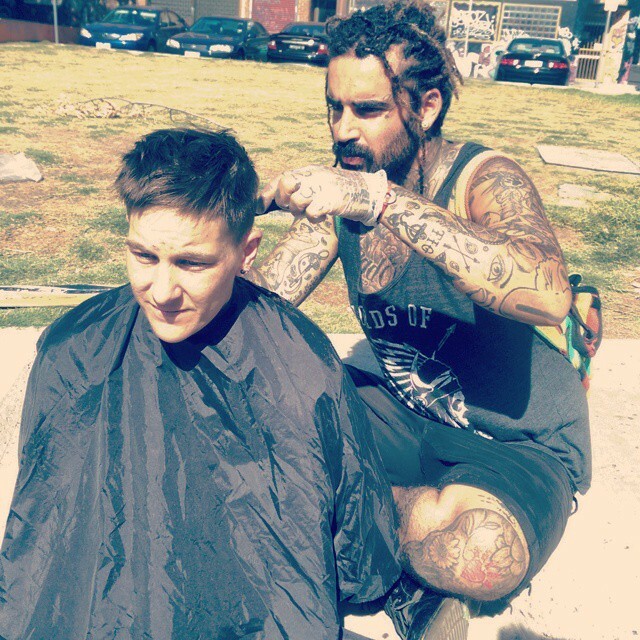 I said how cutting hair – finding a passion, and serving others – has become my new drug. The is Carla, a 34-year-old mother of three children who have been removed from her custody. 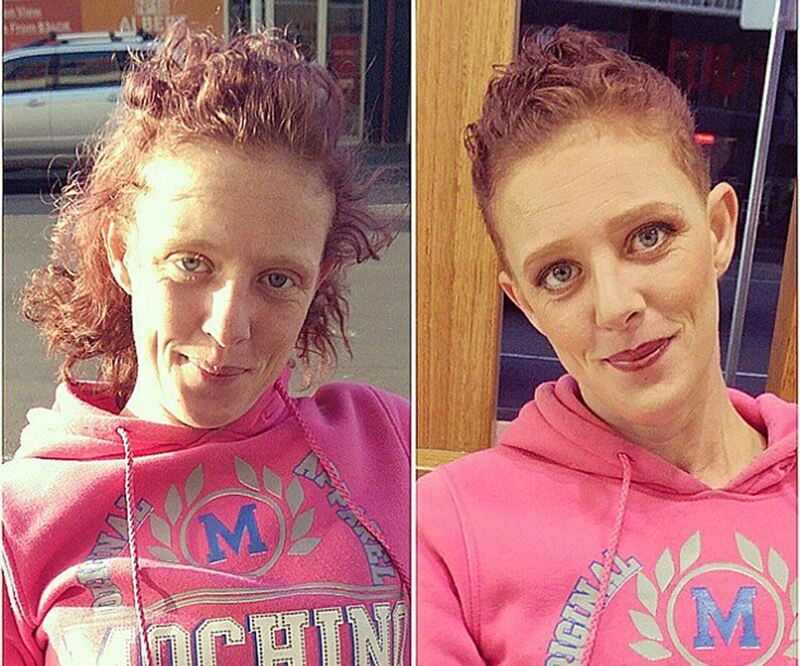 She used drugs to numb the pain of having her children taken away. This is Duat. He is 34 years old and from Africa. As I recall, he said his mother was South African and father was Sudanese. 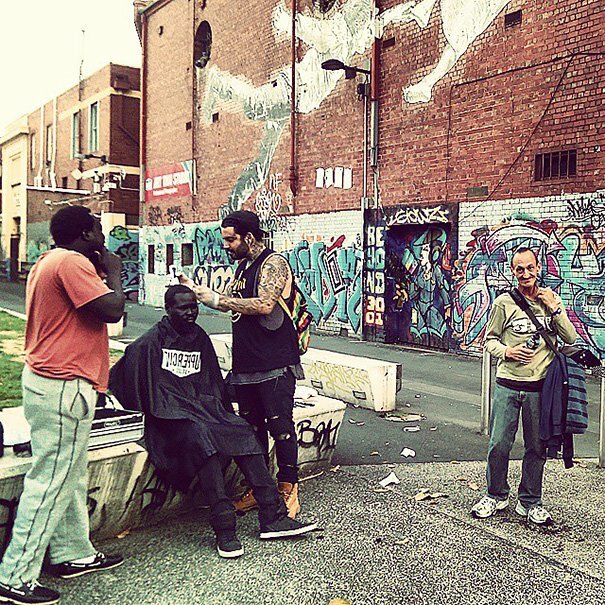 Before I even got to set up shop he raised his hand towards me and gestured that he wanted a cut. It turned out that the man sitting next to him was on the streets and had seen me before cutting hair for his friends and told Duat what I do. He came over quite excited with a smile on his face and introduced himself. He was looking quite rough when I saw him and before I even got to ask what was wrong he told me, “I have just come out of the hospital”. What had happened was he was tending to the aid of one of his sisters, who had an abusive partner. When he went to help her out, he got swarmed and attacked by 5 or 6 men – beating him so hard it landed him in hospital for almost a week. He had a bottle of alcohol hidden in his jacket when he sat down – so I assumed he was embarrassed of it. I tried to warm up the situation and told him about my past and how I suffered from addiction problems also – in order to make him feel as though he could relate. It turned out that he also went to rehab but not from what I thought (alcohol). 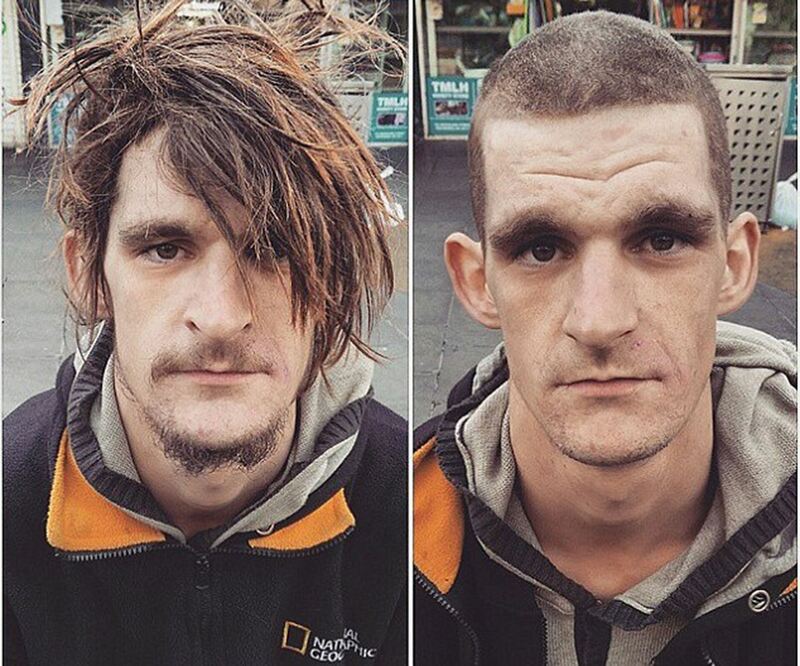 He said “one day, I was smoking a joint with friends and they put meth in it – instantly I was addicted – I didn’t know what I was smoking at the time”. Sad story, the guy was basically tricked into addiction. I don’t know if he still used drugs as I didn’t ask him. But I did ask him what he wanted me to do for him. 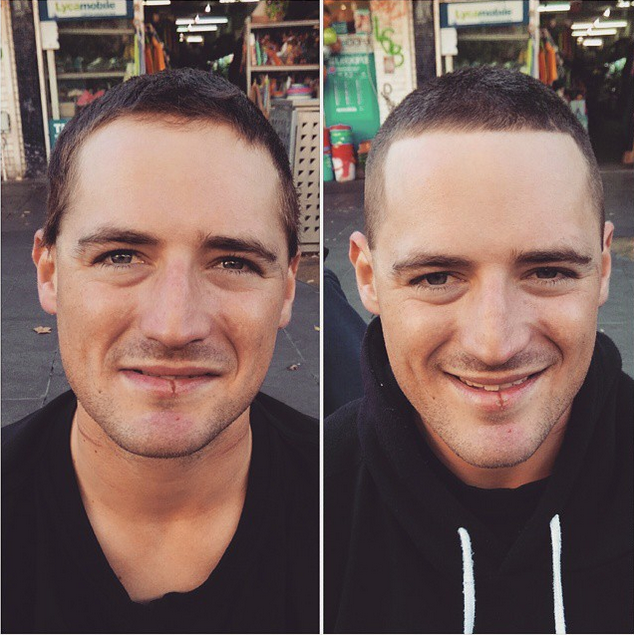 He asked for a fade on the side plus a full face shave. Spraying him with aftershave and cologne, I offered him a nice dress shirt which was donated by my lovely big brother @nimasobhani, which he accepted with gratitude. The thing that made me happier than anything was when he told me with a huge smile, “This morning in the hospital, I asked God – please help me feel and look good – and then I found you, Nas”. 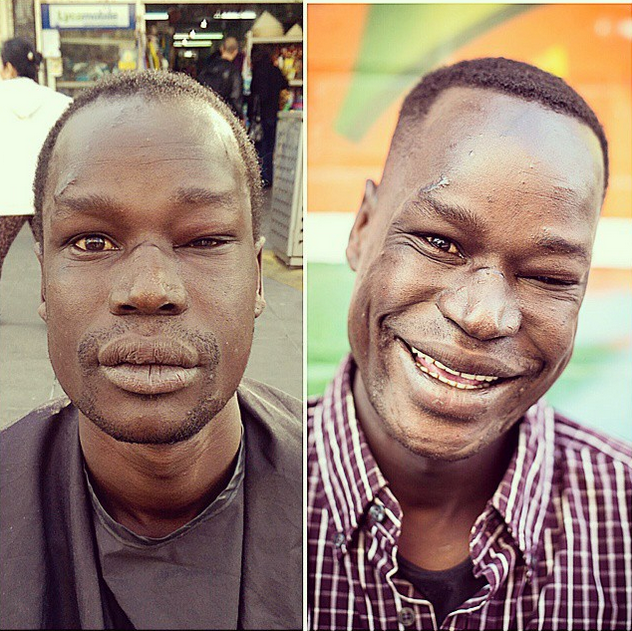 “I love being the streets barber.” Nasir said. This is Daniel. He is 25 years old with no kids or partner. He’s had it quite rough for the past several years and left home when he was around 14 years old. He said the reason he left home was due to an argument he had with his mom when she found out he was on ecstasy – still high from his partying. 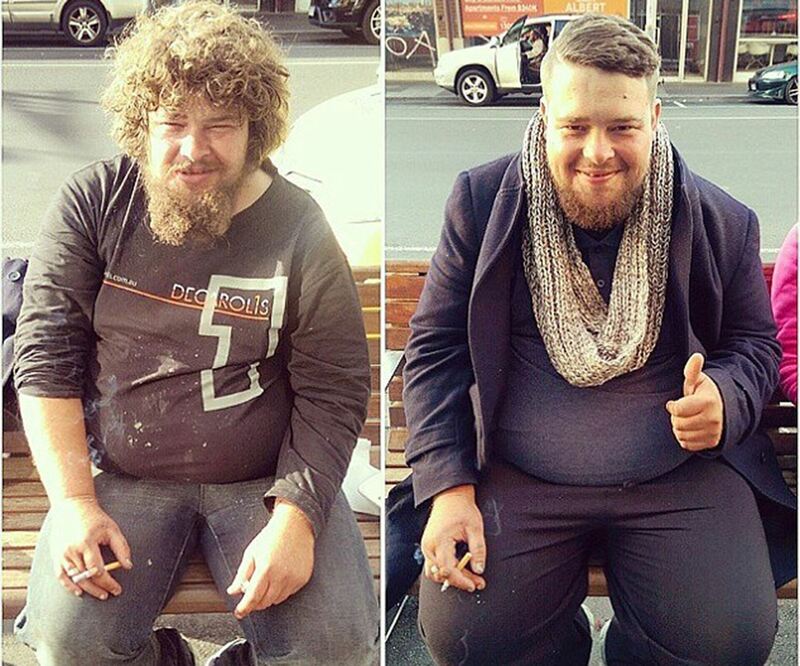 Once he became homeless, he got further involved in drugs. He said that although his drugs of choice are uppers rather than downers, he’ll still use things like heroin when he can – but his tolerance is so unbelievably high that he says it’s dangerous if he got a hold of good stuff, as his usual hit would kill any normal person. Scary huh? Just to know that every time you’re going to get high could be your last, but you don’t care because getting that fix is a higher priority than living. He told me that his main drug of choice is Meth. I asked him why he liked it so much and he said because he enjoys the energy and superficial boost of confidence it can give you. I asked him how and why he got into it and he told me something which rocked my world. He told me “because when I was a kid, the doctors prescribed me Ritalin and it made me feel good, confident, and energetic – almost like ice”. How unsettling to know a prescription medication like that can lead or influence a young person’s brain in such a way. It reminded me of high school and how I enjoyed taking Ritalin – which was also prescribed to me – and how I used to get a ‘high’ without realizing. Daniel had this smile on his face the whole time I cut his hair, and he was extremely polite and well-mannered. Asking him how he maintains his awesome demeanor he told me that he was in jail for a while quite recently. While in jail he was aggressive, negative, and unhappy. In prison he had an epiphany and realized he needed to change that about himself. In doing so he told me it was the greatest feeling and best high because if he can make someone happy then he feels happy. After a cut, dry shampoo, aftershave and deodorant application, he left. I hope he got a good high after meeting me, because he made me so happy and inspired me to be a better person with his outlook. This is Rachel, a 28-year-old mum-of-one. 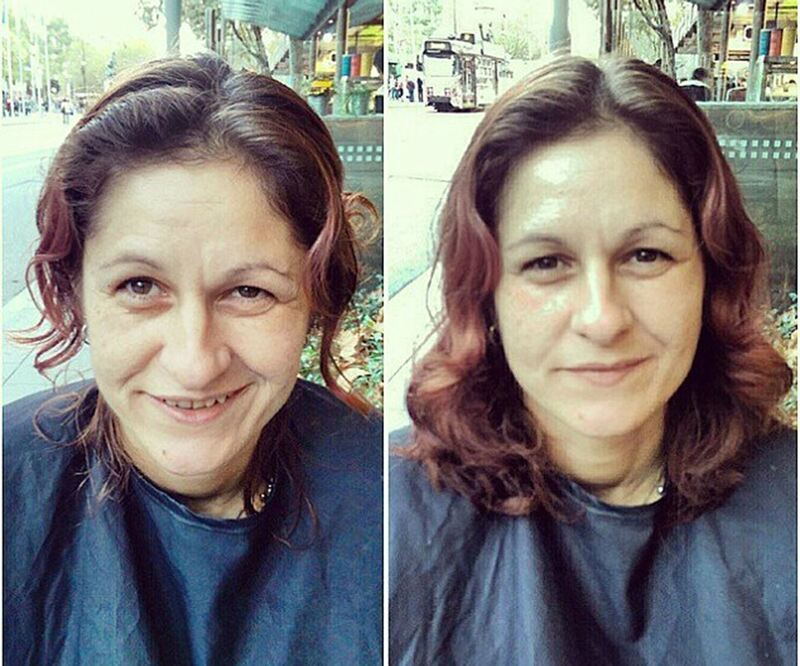 She has been on the streets since she was 13 and using heroin since she was 15. This is Vic. He is dealing with mental health issues, thought to be brought on by drug abuse. 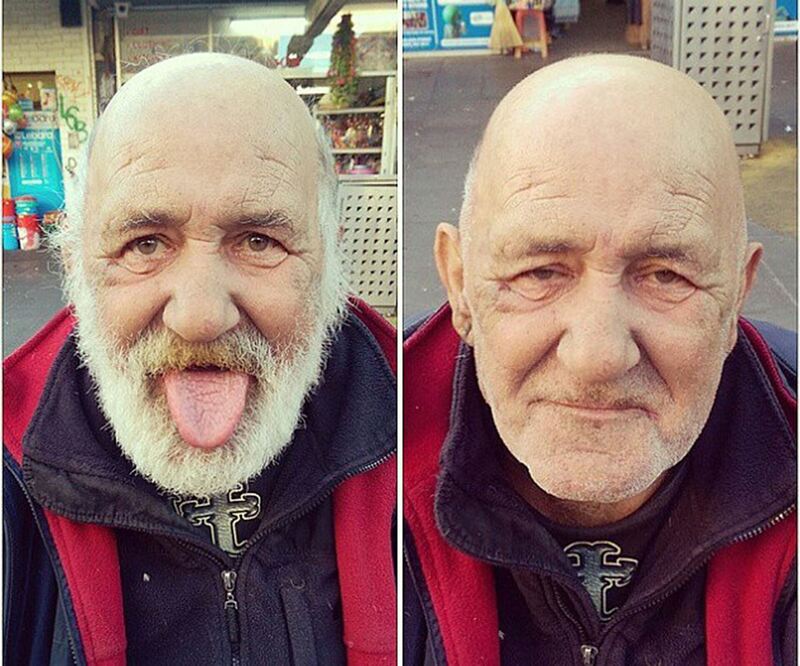 This man wouldn’t share his name or story, but was very happy with his hair cut. This Mark. He is 28 years old. He suffers from a mental illness and hasn’t seen his family for a decade. In all my travels I have never crossed paths with a man this special. In his 50’s – I didn’t end up getting his name nor did I really learn his story – but he created a title for me based on what he observed me doing all afternoon. He started calling me ‘Purity of Love and Faith Good Samaritan Hair Stylist”. He was very insistent that if his picture was to be posted, that under the picture I would put this title which he had created for me. At one point he sang for us, and we spoke about the music we enjoyed. I told him I really like reggae and rap – and that one of my favourite artists was Rick Ross. He told me he’d go out and listen to the guy as he’d never heard him before, then he insisted that he’d come find me at my barbershop and ask for Rick Ross’ hair stylist next time he wanted to see me. Hahaha the man was awesome. As a parting gift after his haircut, he wanted my hair apron – so he could wear it as a cape. In the top right photo you can see him walking away with it around his neck. He turned it around and wore my cape as though he was a super hero. If only he knew, he actually became my hero. Simply amazing. Nasir, you are definitely our hero. Please share positive stories using the social media buttons below. Thank you. My pleasure, love your blog. Beautiful. Re blogging. Thank you! Magnificent, beautiful, amazing, inspiring, incredible, loving, kind, generous, life-changing–for you, for all you have touched and comforted, and for me. You are an angel. One of the best stories I have ever read on Kindness Blog. This man is what love is all about. I love these stories so much! This was such a nice reading and a wonderfull story! I like these kind of stories when simple people really DO the difference. Inspiring!